I like your choice of words, “may likely happen” in your imaginary description of how the Biafran nation will turn out to be when restored. Permit me to also give a counter narrative why some of these six things “may likely not happen” and how they can be taken care of if at all it happens. I want to assure you that Director Nnamdi Kanu is a highly educated man. If you hear him speak and listen to some of the STRESS interviews he had granted various media and even his broadcast on Radio Biafra, you will find out that he is not only educated but intelligent as well. He is also a very charismatic leader; nobody in the history of Nigeria has been able to bring so many people out on the streets like this man did. As you can see, many people are willing and ready to die for this man. Nobody in the history of the Igbo race or Nigeria as a whole, has been able to bring the Igbo-speaking ethnic group together like this man and he is the only man that has been able to close the gap between SS and SE created by the British inspired Hausa/Fulani and backed by the Yoruba gutter media like you are trying to prop up in your article. IPOB is still intact despite billions of dollars earmarked by the government to create problems by infiltrating her rank and file. I am very certain you know all these, but you are just feigning ignorance. Moreover, Kanu has said it time without number that as soon as the Biafra nation is restored, his job is complete and he will retire to his home. He is not interested in who becomes the president, but getting Biafra restored. There is no society without internal strife. We are different individuals and as such want different things, see things differently and have different ways to solving problems which is why there are always strife even in our different homes. But the strife we will have can never be compared nor equated with what we are passing through in Nigeria. Do you remember the 1966 coup? A coup that was carried out by soldiers of different ethnic groups in Nigeria was tagged “an Igbo coup,” Igbo soldiers were killed. Do you still remember the May and October 1966 pogroms in which more than 100,000 Igbos were massacred? Can you remember how many times Igbos were killed in the North for no just cause? Like the cartoon of prophet Mohammed in Denmark and so on, or the numerous religious uprisings that targeted mainly Igbos. Or the 2011 election riot that killed many Igbo youth corpers in the North. Remember, Igbos here refer to people from the entire old Eastern region because when killing starts, we are all Igbos, but when you people want to milk or siphon our resources, you will start talking about minorities as if there are no minorities in the North. The difference you see among different Biafran groups is because we know that the federal government is sponsoring some of them to destabilize us but that would not prevent us from moving forward. Remember Yakubu Gowon said that if he had known he wouldn’t have gone to war, he would have rather sponsored an Igbo man to counter Ojukwu. That is part of the strategy of this present government against the Biafra agitation. I must tell you that IPOB, MASSOB under Uchenna Madu and LNC are not against each other. Of course there are IPOB families in Ebonyi state and so they are part of the agitation. Even if they are not part of it, they will still join when Biafra comes. Everybody’s voice or actions mustn’t be heard before you realize they are working tremendously for Biafran freedom. Corruption is everywhere. You must have seen what happened in Democrats National Convention in the US, how the DNC who are supposed to be neutral worked against Sanders, you also must have seen the way Clinton’s investigations were carried out. So corruption is everywhere but you can only say that it is worse in Africa. Biafra may not be an exemption but the difference is that the situation where every tribe will fight for their tribesmen even if he is corrupt will not exist. 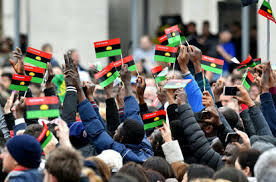 Nigeria’s present political elites may not be the leaders championing the political atmosphere in Biafra because this agitation is being taken up from the grassroots and that is why it will never die. Moreover, I don’t see those Nigerian politicians coming to hijack the Biafra political structures. They know this, that is why majority of them are not supporting the agitation. They are aware that in Biafra, they can’t be given the corrupt opportunities made available to them on a platter of gold in Nigeria, and that’s the reason some insincere, rogues and corrupt elements amongst them are against the struggle for a sovereign State of Biafra. The agitation by the common masses means that a vote of no confidence has been passed on the political elites. Even if somehow they find themselves in power, they will know that they are answerable to the masses who fought for the freedom. Like we have been saying, there is nothing like South-South. It doesn’t even exist in the cardinal points, it is your creation just to divide us. Are there no minorities in the North? Why was there no minority commission in the North or West? Why was there no North-North or West-West? Are all in the present day Western Nigeria Yorubas? If not because you people (Yorubas) have ulterior motives, where is that commission needed most, is it in the Eastern region that never had any history of internal war or in the North and West where there were wars of conquest. Your article clearly shows that you are trying to instigate that division your people propagated during and after the war but unfortunately for you, we are now wiser and we have come out stronger ever since. We know who is dominating who now, we know who wants the oil resources because we know who has 83% and 15% of the oil blocks. We know who said that Bayelsa oil belongs to them and who is claiming ownership of the oil in Bayelsa simply because of their large land mass. All the same, it will be good to note that Biafra is never by fire or force. If the so-called South-South wants to stay with Nigeria or want their own separate nation, Biafrans will never force them. Igbo-speaking Biafrans or Igboland in general, are not landlocked as you claim. You mentioned Ndoki port, you forgot that there is a port in Onitsha, you forgot Oguta, Omambala (Anambra) river and many other rivers that can be dredged and developed if need be. You people have shamefully abandoned the “we feed you because your land is not fertile” mantra because the hardship in the country now has really shown who is feeding who. This is another story that is making us believe that Yorubas are afraid of the imminent restoration of Biafra. Why must all Biafrans come home when Biafra is restored? Why are there Yorubas in the UK, US and other countries? Three days ago, Kenya clamped down on Nigerians in Kenya and arrested about 40 Nigerians, more than 70 percent of them are Yorubas. Why are they not in their country Nigeria? Are there no Nigerians with properties outside Nigeria? My dear brother anybody can live and own properties anywhere in the world and there is a law covering that aspect. Lives or properties outside your original region cannot be lost simply because a new nation was created. That is the argument and false information you are using to mislead and scare our brothers that made some of them afraid of Biafra restoration. Unfortunately for you, times have changed, gone are those days when you have monopoly of the media where you spew all sorts of lies and falsehood and get away with it. We can now counter them and put the record straight. Yes, it is true that Yorubas are our natural allies because we are both from the South and has close boundaries with each other. We have problems because of mistrust that exists amongst us to the advantage of the North. It is unfortunate the Yorubas don’t realize they are also marginalized, only that the East are more marginalized than they are. I don’t know if any Yoruba had listened to Sir Ahmadu Bello’s speech that was published on the Parrot Newspaper of 12th October, 1960. Let me just rephrase a part of it, “The new nation Nigeria should be an estate of our grandfather Uthman Danfodio. We must ruthlessly prevent a change of power, we will use the minorities of the North as willing tools and the South as a conquered territory and never allow them rule over us or allow them have control over their future.” Now, see that in that hate speech, he did not say “East” as a conquered territory, rather he said “South.” It is unfortunate that the West think that all is well with them, that they are in a better position in Nigeria, forgetting that these people not only want to perpetually rule us by force, but do not also want us to control our future. Finally, I will like to tell all Nigerians that Biafra is never a call for war but a call for us to go back to how we were originally before the British joined us together for their selfish economic interests. We have lived together for more than hundred years and anybody who wants to tell himself the truth will concede that it has not worked and will never work. Our forces union and amalgamation appears to be a curse to us all, that's the Genesis of all these problems and injustices. Couples marry if they find themselves compatible and they divorce and go their separate ways when they realize that they have what I call “Love Lust”, so why can’t we do the same? Why can’t we separate, end this forced marriage and peacefully go our separate ways for the better. We hate each other, we are different. We have different value system, different religion, different food, different clothes, different languages and so on. We cannot abandon, neglect or treat the issue of Biafra or separation with levity. Instead of us to allow this to linger, and wait till war separates us, it is better for us to separate in peace so that we can be happy neighbours tomorrow where healthy rivalry and bilateral relarionships will help each nation to be better while helping each other to be the best we can.